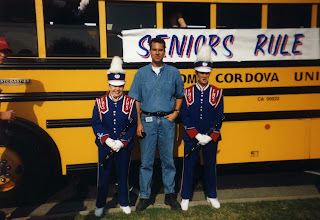 Many, many Saturdays were spent on big yellow school buses, travelling all over the state to various competitions with the band and colorguard. Good times! 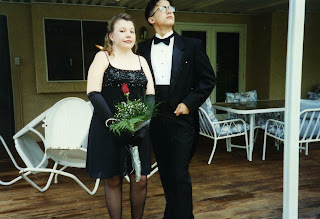 Ahh, Junior Prom. What fun we all had! I don't know what the colorguard gals were doing to their instructor, but this is a cute pic. Who knew I could have so much fun with a scanner? 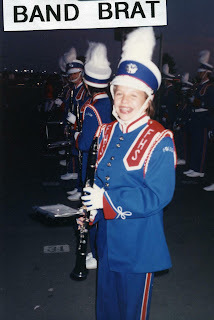 Here I am as a freshman in high school--my first football game with the marching band. I still had braces on my teeth! 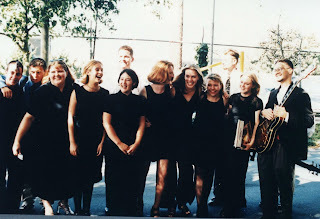 Here I am as a sophomore, getting ready for an evening band concert. 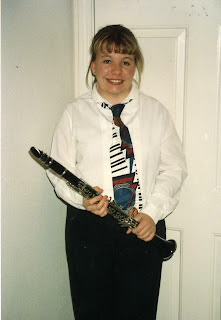 I was so into my musical tie. 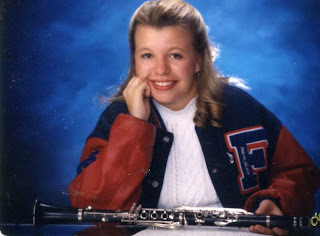 This is one of my senior pictures--notice the letterman jacket, and the ever-present clarinet! 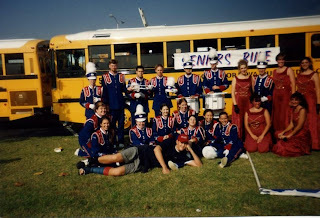 Here's the senior class of the marching band and color guard. 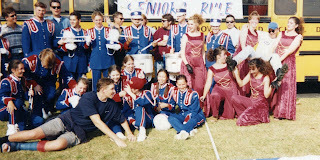 I'm the kid wearing the marching hat, sitting on the ground. 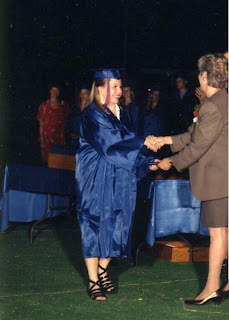 June 6, 1996--Graduation Day. My dad took a ton of pictures of me in our back yard, next to the pool. The proud grad receives her diploma. 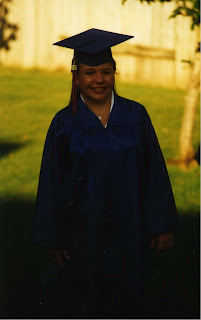 The only time I've been prouder than that moment is when I graduated from college! 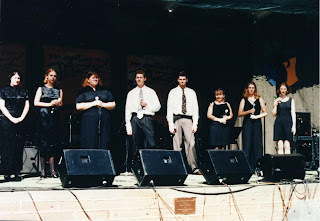 I scanned about a gazillion old pictures today from the BD age (Before Digital). 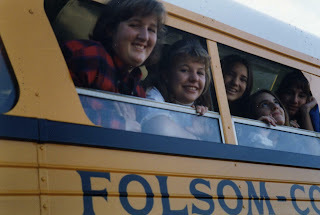 Here's the first set, a slideshow called "Little Meg." As you can probably guess, it's me as a little girl. Last night I got the idea to go to Santa Rosa. I decided to get a couple of things done this morning and then go. So this afternoon I drove the 80-something miles to Santa Rosa to pay homage to Charles M. Schulz, creator of the "Peanuts" comic strip, and over 50 years of humor and pathos. I started at the Charles Schulz Museum, a wonderful tribute to the cartoonist opened by his family in 2002. I got to go to the grand opening that summer, but I hadn't been back since. As I got out of my car, I got a huge grin on my face at seeing the Peanuts figures oustide, and hearing the music from various plays, TV specials, etc. The grin did not leave my face all afternoon. What a happy place! There is a small patio area outside, and it includes a kite-eating tree and an enormous baseball cap. After this, I crossed the street to the ice arena to take a few pictures and then have a meal at the Warm Puppy Cafe. I ordered a Beagle Burger and a soda, and sat down to enjoy. What a lovely afternoon! I detoured through Wine Country on my way home, finding myself in Napa. I called Summer, but she was unfortunately working and unable to meet me for a bite to eat. So I continued south towards the east bay, and arrived home at about 8:00. I'm still smiling.